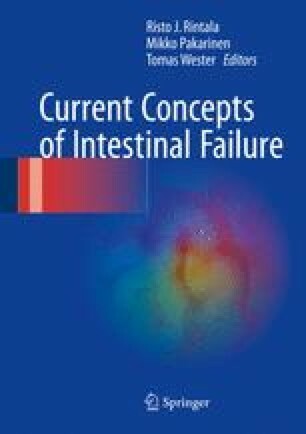 Pediatric intestinal failure (IF) is associated with significant morbidity and mortality, the most frequent underlying etiology being short bowel syndrome (SBS). The major goals of treatment include normal growth, prevention of complications, and weaning off parenteral support (PS) by maximal utilization of adaptation potential of the remaining gut. In a subset of SBS patients, the small intestinal remnant undergoes excessive adaptation-associated dilatation. Abnormal postresectional bowel dilatation predisposes to stasis, defective propulsion, and mixing of intestinal contents, which in turn may promote bacterial overgrowth and worsen malabsorption. Normal and uniform bowel diameter can be effectively restored surgically by serial transverse enteroplasty (STEP), while preserving the entire limited intestinal absorptive surface. Elimination of pathological dilatation with simultaneous increase in functional bowel length has potential to decrease parenteral nutrition (PN) dependence by improving enteral feeding tolerance and intestinal absorptive function. Reduced PS requirement limits the extent of complications, improving prognosis and quality of life. Current evidence suggests that STEP is a safe and well-tolerated procedure, which facilitates weaning from PN and promotes growth in selected patients. Redilatation is a common and significant complication, which can be dealt with by repeat STEP in symptomatic cases. Eventually a majority of patients achieve enteral autonomy. STEP may reduce the need for intestinal transplantation. Mikko Pakarinen was supported with research grants by the Finnish Pediatric Research Foundation and the Sigrid Juselius Foundation. Tomas Wester was supported by Her Royal Highness Crown Princess Lovisa’s Foundation.